Security systems used to have one job. Today, they're one of the most versatile and useful technologies in the modern home. Starting in 2001, Alarm.com has been applying cutting-edge connected technology to home security. A modern security system now comes with cloud intelligence, machine learning, app-controlled automation and an array of fully-integrated, connected devices. Not only is it even better at stopping burglars, it's also the center of the automated, connected home. We saw early on that we could apply our security technology to solve a broad range of risks, challenges and inconveniences around the home. We and our service provider partners don't just keep your home secure; we help keep it safe, energy-efficient, comfortable, convenient and free of sudden repair emergencies. Here are a few of the recent innovations currently available to our 5 million users. With an Alarm.com-powered security system connecting them, connected devices all around the home can combine their intelligence into an understanding of what's going on, and proactively do smarter things for you. 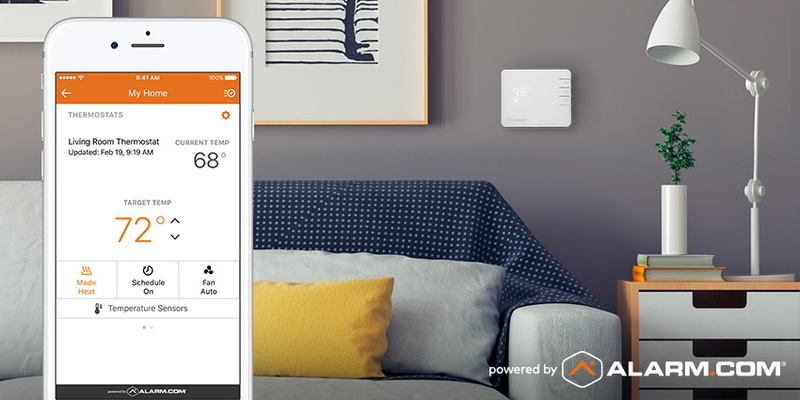 Take Alarm.com's smarter thermostat. It has unique energy-saving features, such as the ability to read security sensors around the home and pause heating or cooling if you have a door open. It uses remote sensors to know the temperature in different rooms, and can optimize for precision comfort in any room with a sensor. It even protects your home itself by alerting you to high humidity that could cause mold, or to dangerously low winter temperatures that cause water pipes to freeze and burst. 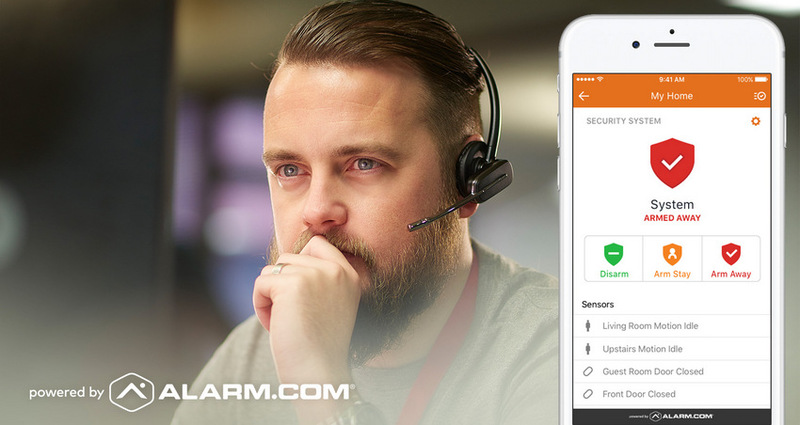 Alarm.com's combination of smart, connected hardware and advanced security intelligence makes light work of complicated everyday security issues. Take spare keys, for example—or don't. 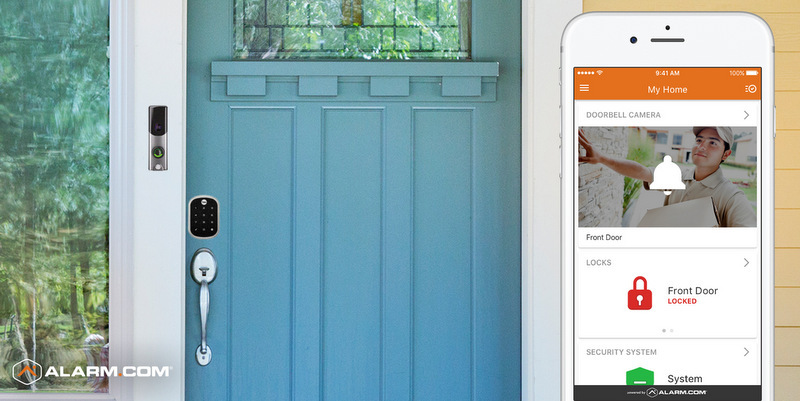 With Alarm.com-connected smart locks, family members and trusted visitors get four-digit codes instead. As well as unlocking and locking the door, codes can generate smartphone alerts to keep you aware of who's coming and going. Unlike spare keys, you can delete them instantly, ensuring that only the right people ever have access. Add an Alarm.com-connected doorbell camera to your door as well and you have a solution to the growing problem of package theft. There's no need to stay home for a delivery; instead, you can use your smartphone app to verify a delivery person, unlock your smart lock, ask them to leave the package inside, and then secure your house again once they leave. Most security technology can alert you when something bad happens. 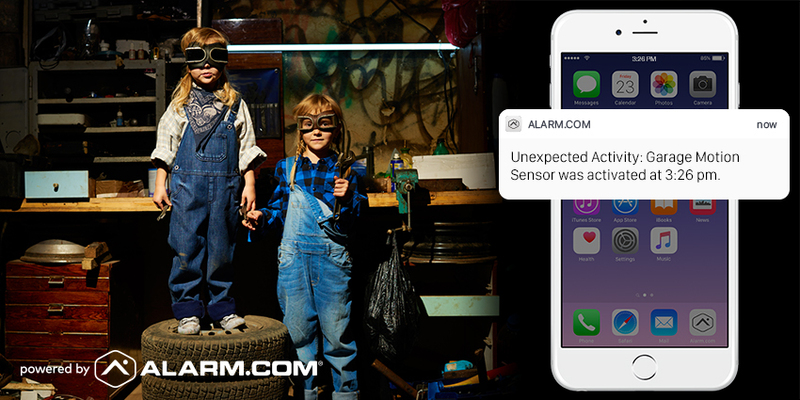 Alarm.com can let you know beforehand, using machine learning and sensor intelligence to spot activity that could spell trouble. Unexpected Activity notifications are a new type of smartphone alert generated by our Insights Engine. It learns your home's activity patterns to let you know when something out of the ordinary is going on—for example, your kids getting into the garage on a weekday when it's usually empty. These alerts can be triggered by contact sensors on doors and windows, or by motion sensors you've placed in dangerous or forbidden areas. You can even ‘train' them over time with simple feedback that the Insights Engine adapts to. We may have transformed the security system but we didn't ignore its original task. We've improved on that, too, with hi-tech safeguards like Crash and Smash protection. This feature protects you from burglars by ensuring that even if an intruder smashes your security panel, Alarm.com still signals for help. When your front door opens and the security system starts its countdown, Alarm.com's cloud platform logs the event. If the panel goes offline before sending either a ‘disarm' or ‘emergency' signal, Alarm.com proactively reports a suspected Crash and Smash event to your home's professional monitoring station, who will call law enforcement on your behalf. Want to know more about Alarm.com? 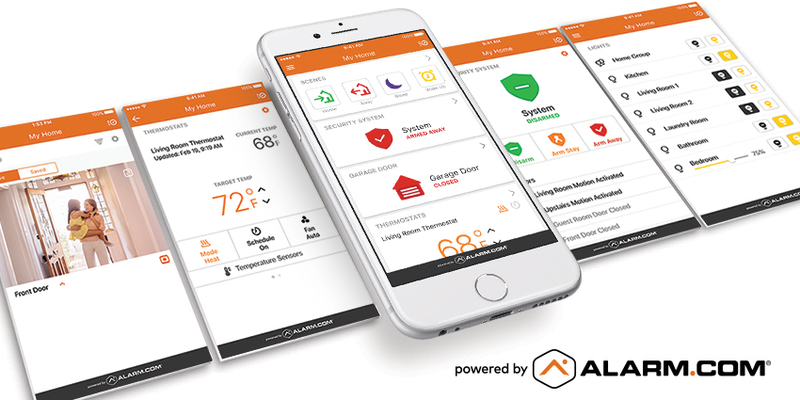 The leading platform for the connected home and business, Alarm.com powers more than 5 million properties—including our newly-opened Washington, DC, Demo House. For more news, click here.